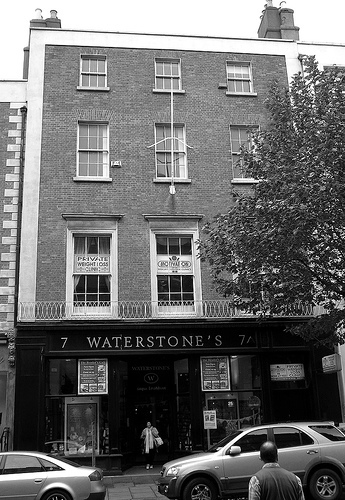 Today Waterstone’s Bookshop announced the closure of its two Dublin branches and the Sunday Tribune newspaper went into receivership. I spent the day in my bear onesie; having spent an unfortunate night vomiting. The news about the Waterstone’s closure reached me via text message from my dismayed, book-selling LSB who had just finished work. Nursing a saline medicinal solution and rather cosy in bed, at the moment my phone beeped, I had just finished reading Stefan Zweig’s The Post Office Girl; a story of cultural and ideological tragedy that depicts the epic and transformative power of money. With these thoughts at the back of my mind, I got around to researching the “Face of Ireland” beauty competition, which a friend of mine told me that she had entered last week. The contest, which I had not heard of before is now in its fourth year and promises the successful candidate “a year of glitz and glamour”. But both come at a price. If I have understood the terms and conditions of this dubious divafest correctly, I calculate that all candidates that reach the grand finalé will have forked out €750 for the privilege. The website stipulates that: All candidates who are selected for interview will have to pay a small fee for the upkeep of the competition. I know from my friend that this “small fee” happens to be €150, a sum with which you could procure at least ten great works of literature from Waterstone’s bookshop. In an uncanny commercial coincidence it just happened that every girl selected for interview also got through to the next round. My friend opted out at this point and in an indignant text message which I sent her from Penneys in O’Connell Street I ensured her that she had done the right thing. Should she have progressed further through the competition, she would have been required, in accordance with the terms and conditions, to sell at least 10 Tickets at a costing of €60 each for the semifinal show. This year’s Face of Ireland, Louise from Donegal blogged happily of the night of the grand finalé that Between cat walking, interesting questions and a few unexpected party pieces an entertaining night seemed to be over in a blink! I know it’s a cliché but to have made it that far, every single one of us was a winner!. I suppose with a loose interpretation of winner, any achievement is possible. In a society which has lost its money, its bookshops and its most educated people the success of this kind of vacuous endeavour makes a farce of us all. I have a lovely memory of sitting upstairs in the coffee shop of Waterstone’s on a spring afternoon during my first year of university. Our tutor had taken us there to discuss Structuralism over a cup of hot chocolate. Soon enough the Deconstruction will begin at that site and the future Faces of Ireland and their fans will stand proud, pouting over it all.